FFA - All-American Muslim (the television program) sheriff character oversees stoning of Christians peacefully protesting Dearborn Arab Festival. Please send your email to Prosecutor and Michigan officials. How many more law enforcement agencies will give way to the hostile, violent behavior of Sharia minded Muslims in the future? Left as is, this situation sets a new, very dangerous precedent of permissible criminal behavior. Click above photo to see video. 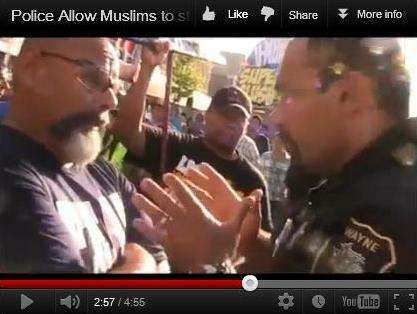 All-American Muslim (the television program) sheriff character oversees stoning of Christians peacefully protesting Dearborn Arab Festival. Dozens of Muslims threw bottles, eggs, crates, concrete and urine at Christians lead by Ruben Israel. The Christians were exercising their First Amendment right to peacefully assemble on PUBLIC property to express their disapproval of Islam during the 2012 Dearborn Arab Festival. The Dearborn Arab Festival was held on Father’s Day June 17, 2012. CAIR (Counsel on American Islamic Relations) Pennsylvania reports “Some of the featured cast members in All-American Muslim reflect how integral a part of the Dearborn community Arab American Muslims are. Mike Jaafar, for instance, is the deputy chief in the Wayne County Sheriff’s Department. Israel countered “Well, no there were officers that actually turned the other way.” Israel asked Richardson for two officers to insure their protection. While some people may disagree with Ruben Israel’s method of protest, he and the twenty five other people in his group were entitled to EQUAL PROTECTION under the law. They were on PUBLIC PROPERTY when hundreds of assault violations were inflicted upon them without law enforcement apprehending the offenders. Israel’s group was forced to forfeit their rights or face arrest when the other party committed the crimes. How many more law enforcement agencies will give way to the hostile, violent behavior of Sharia minded Muslims in the future? Colonel Etue (MSP Director) asked that I respond to your message. I have confirmed that no Michigan State Police were assigned to this event. The Michigan State Police has no supervisory authority over other agencies or their officers. We suggest you contact the agency or agencies you believe failed to take appropriate enforcement action to lodge your complaint. Therefore, sending emails of concern to the Michigan State Police will not help. Additionally, sending emails to the Wayne County Sheriff who allowed his undersheriff to appear on The Learning Channel television show All-American Muslim makes little sense. Furthermore, sending emails to the Dearborn Police Chief who has allowed the arrest of Christians at past events makes even less sense. We cannot silently sit back and allow this inequity in law enforcement to go unchallenged. Florida Family Association has prepared an email for you to send urging Wayne County Prosecutor Kym L. Worthy, Michigan Governor Rick Snyder and Attorney General Bill Schuette to investigate the crimes committed against these twenty five Christians and violations of their equal protection rights.